Around the world, people love. They sing for love, they dance for love, they compose poems and stories about love. They tell myths and legends about love. They pine for love, they live for love, they kill for love, and they die for love. Anthropologists have found evidence of romantic love in 170 societies. They’ve never found a society that did not have it. Helen Fisher, The Brain In Love. I Want To Know What Love Is throws a spotlight on long-buried memories, bedroom fantasies, crushes and conquests. 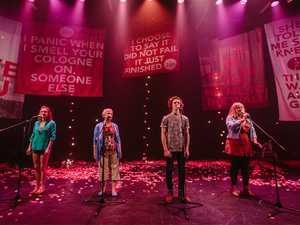 Acclaimed Queensland performance collective The Good Room asked members of the public to anonymously submit their stories of love - fragments and memories, confessions and admissions – and they’ve transformed those secret submissions into magnificent declarations centre stage. Submission #87: “It’s been years, but I still think of you and wonder ‘What could have been?’” Submission #346: “I choose to say it did not fail. It just finished.” Submission #302: “Jemma forever xo” This is for everyone who’s ever loved. Anyone who’s ever hurt. This is for you.